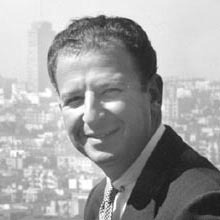 Herbert Eugene Caen was a Pulitzer Prize-winning San Francisco journalist whose daily column of local goings-on, social and political happenings, local anecdotes, and insider gossip–often poking fun, but rarely if ever hostile or ill-willed–appeared in the San Francisco Chronicle for almost sixty years, except during a relatively short stint at the San Francisco Examiner. His name was a household word throughout the San Francisco Bay Area for decades, and republications of his old columns remain a prominent Chronicle feature many years after his death. Isn't it nice that people who prefer Los Angeles to San Francisco live there? Like a camel, I can go without a drink for seven days–and have on several horrible occasions. Parking is such street sorrow.